As much as we love our parents, neither Hubby nor I grew up with particularly stellar financial management examples set before us. Now our kids are still very young, but we have decided we want to teach them the proper way to view and manage money. It's really important once we have identified a weak area in our own upbringing to seek out tools that will allow us to do better. This is why programs like the Money Management Certification Program by FamilyMint were created. FamilyMint was developed by two Michigan dads who saw the need for money management training in their own families, among their own children. They worked together to create a program that would help instill financial habits in children that would last a lifetime. They knew the program had to be something that would work long-term, because it takes time to develop information into behavior and behavior into habit. They wanted something that could be used at home because kids mostly learn about how to use money from watching their parents. They may learn to add and subtract dollars and cents at school, but it's not their teachers they tag along with at the mall. 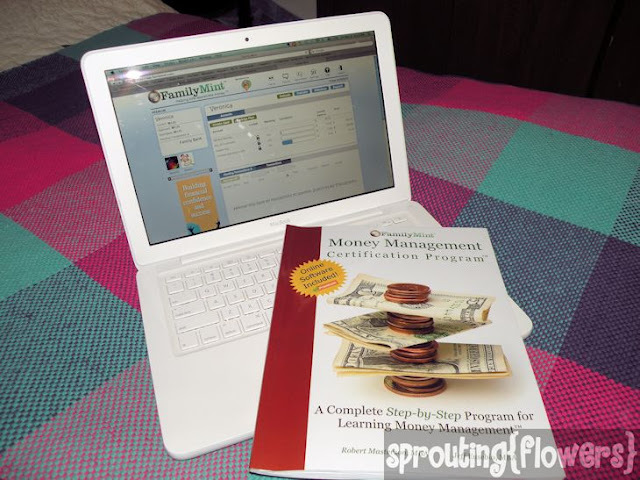 What is the Money Management Certification Program? The program, which was just launched last November, is twofold. First, there's the workbook. It is part of the certification program, but it is also a complete, self-contained program that does not require you to have a computer or internet access! The certification program is available from FamilyMint for $29.99. This is an introductory price that includes the workbook and a lifetime subscription to the FamilyMint Premium app and will be good through Summer 2013. Each chapter is laid out in a logical fashion with vocabulary terms highlighted along the side and fill-in-the-blanks to engage students along the way. 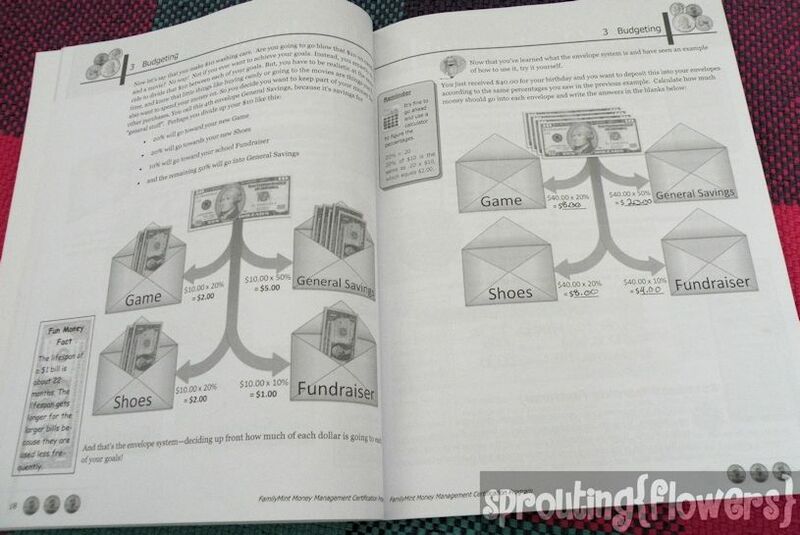 There are even fun facts about money on nearly every page! It doesn't take too long to read through each chapter and complete the written exercises, what takes time, however, is establishing money management habits. For this reason, I would recommend not rushing through, but breaking it down into small chunks and then putting it into practice before moving on. 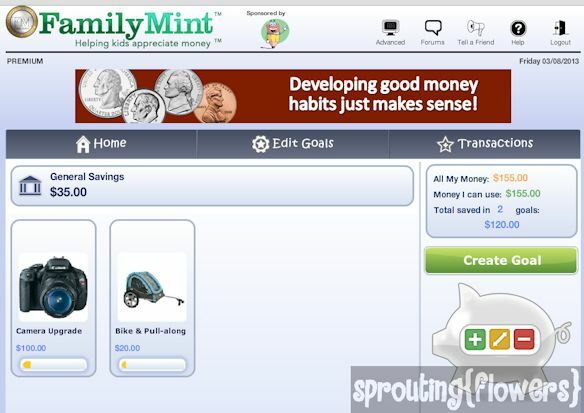 The second part of the certification program is the FamilyMint Online Money Management application. 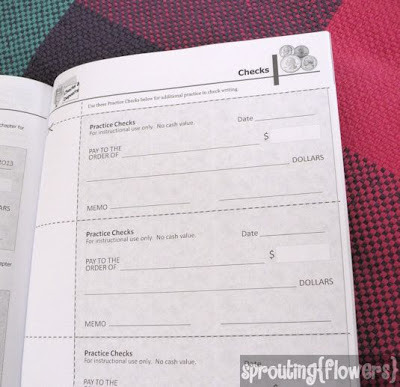 Just like the workbook, it can be used alone or in conjunction with the paper portion. The app is a fun, easy-to-use, virtual banking simulation. You, the parent, set up a virtual bank (you even get to name it!) and become the virtual banker. The child gets an account at your "bank" where he can make deposits, set goals, and track his progress. You can set up automated deposits for allowance or make matching deposits for certain goals you deem worthy. And it's all accessible from any web browser; you don't need a smart phone to use the app! 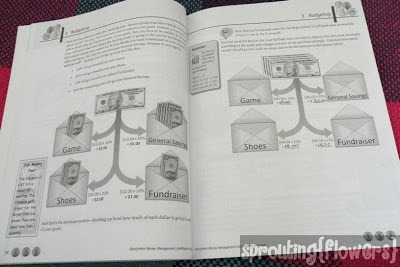 You can use it in real-world situations to manage your child's real-life money. But you don't have to! You could choose to do it on an entirely academic basis using role-playing or theoretical scenarios if that works better for your family. You don't need real money to teach the concepts! You could use it to track points as an incentive program for reading or chores or anything your little heart desires! My kids are still a little too young to benefit from this program, so I borrowed my friend's daughter Veronica and put her through the paces. 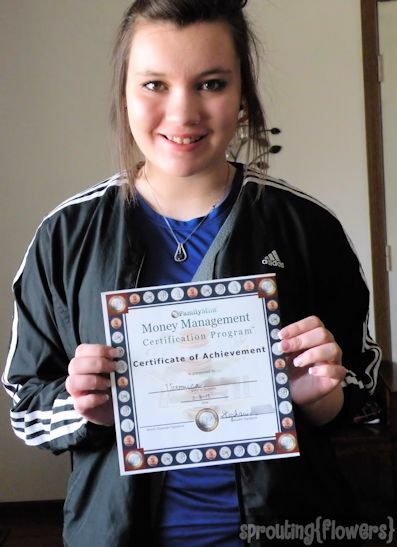 She was really excited for the opportunity to go through this money management program. Having that certificate will look great on any college or job applications she submits in the next few years. She said the workbook was easy to understand and did not take a lot of time to accomplish. She's been able to set and achieve a few financial goals and said she plans to continue doing so in the future. Screen shot: my savings goals! I personally think the FamilyMint online app is really fun! I've been using it to track the money I made sewing so I can save for a few special things I want: a digital SLR camera and a bicycle with a pull-behind trailer. It's so much fun to pull an image of my goal off of Amazon and watch the meter creep toward completion as I save a little here and a little there. And it's so much nicer to know exactly how much I have rather than just looking at a jumbled jar of change on the top of the refrigerator! Miss M has been setting goals and saving too. She doesn't quite get the concept of limited resources yet, so she keeps asking to set up one goal after another. But if we keep plugging away, she'll get it eventually. After all, she's only six! Cindy, your kids are probably at just the right age to really make the most of the program!